At long last here here is the third and final chapter of the Bake Shoppe Birthday posts. Aprons. I knew I wanted to make these for the party, but I did not know it would be nearly impossible to find a decent pattern. So with the help of my patient Mother we took matters into our own hands and I sketched up a design. With 2 parties in the works, they had to be simple enough that we could make about 20 (without wanting to kill ourselves! ), yet cool enough to satisfy the designer in me. I think we struck a great balance. Oilcloth fabric worked perfectly for the base, and trimming with bias tape and ric rac gave them a finished look, while also eliminating the need for hemming (other than the top of the girls pockets). For the girls we added a sweet scallop bottom and two pockets trimmed with ric rac. For the boys we did one larger pocket and kept the bottom straight. The oversize pattern is too big for a printable download, so instead i've provided the sketch with measurements and supply lists so that anyone interested can hopefully replicate the idea relatively easily. Just give me a shout if you have questions, & happy sewing! Welcome to part two of Bake Shoppe Birthday extravaganza, the trilogy! For details about the event itself, visit the previous post. For a free printable pdf download of the party invitations, welcome sign, tags, & recipe card, look no further! For more info on how we made the simple kids aprons, stay tuned. Note that instead of the usual envelope I opted for these awesomely vibrant polka dot bags by The Sugar Diva. I purchased mine at Zurchers along with The Sugar Diva's sweet striped paper straws. I just WISH I had seen their plastic mason jars!! Genius. Instead I'm stuck with glass... adorable? yes. kid-friendly? not so much. Anyway, back to the invitations, the outside was embellished by wrapping baker's twine a few times and attaching a "YEAH!" tag. We then lovingly hand delivered them. Aside from the invitations, we used the tags on the cupcake boxes (attached with washi tape), and as accents for the food table. Birthday parties. Sure to be the death of me! Luckily I've got my littles somewhat convinced that it is reasonable to do a big bash every-other-year... so we can all have plenty of time to recover. That being said, this is a non-party year, and i must admit i'm feeling a titch nostalgic for last year's good times. Amidst the chaos I never posted pics, so here's a much belated accounting of our sweet soirée. Both my girls absolutely love to bake, so when one decided to have a bakery themed birthday party the other quickly demanded the same thing. (Can't say I was sad about invitation designs and party plans pulling double duty!) For my oldest's 7th birthday, I figured her friends could handle a simple recipe. Upon arrival each girl picked out an apron (to keep! ), and together we made "cheesy pretzels" from scratch. Everyone had their own small bowl and measured out ingredients themselves. They loved getting creative with their pretzel shapes. (Tip: put parchment paper on the baking sheets and use a sharpie to write the kids names by their creations.) While our goodies were baking, and I was swapping out pretzel makings with supplies for our next project, we kept the girls occupied with the always fun "donut-on-a-string" game. Rolling the whole mess up in the disposable tablecloth and simply putting out a fresh one made for quick and easy cleanup between activities. For our second project, each girl got 4 pre-baked cupcakes to decorate with a rainbow of icing and candies, as well as a box for carrying their masterpieces home. Fast forward a couple months, and it was time for party number two. This one for my cutie turning the big 5! With littler hands in attendance we wisely simplified. The party was essentially the same, except instead of making our own pretzels each child received a pizza kit to assemble (love love this product from Papa Murphy's!). I must give a huge thanks to everyone who showed up to this event despite the massive snowstorm, and to my sweet sister-in-law and neighbors who were able to get our pizza's baked since our power decided to go out right before party time!! Honestly, aside from the aprons, I think everyone's favorite thing was the super easy donut game. I should probably take that as a lesson in the beauty of simplification, ha! But a year later we still get comments from friends and family about how much they love their aprons, so that makes it all worth it. Looking for a freebie download of a Bake Shoppe Birthday invitation & welcome sign? Check out the next post ;) Looking for more details about the children's aprons? Check out the post after that! Meanwhile, below is a download of the pretzel recipe. These were printed and attached with baker's twine to the cellophane bags used to send their pretzels home. enjoy! In typical fashion i spread myself so thin this summer that it's a miracle i didn't implode. Picture six weeks straight of daily swim lessons. SIX weeks!! rain or shine. not to mention tennis, dance, and gymnastics, all gloriously piled on top of a full work schedule. did i mention the potty training? Who needs sleep?! (and before wagging your finger at me for overbooking my children and effectively ruining their childhood you should know they were 100% on board... with the occasional 1% day mixed in of course). Summer is bonkers busy, as every mom can attest. Which is why i had visions of nothing more than a glorified playdate for my sons 3rd birthday. What toddler needs anything more than a sunny afternoon mixed with a couple friends and a slip-n-slide? That's how it started, but as the big day loomed closer and other parties were attended, his expectations were clearly light years beyond what i had anticipated. The mommy guilt got to me. Next thing you know, i'm frantically whipping up last minute "Lion King" themed invitations, scouring party stores for décor and favors, and staying up til the wee hours of the morning stressing over a menu. note to self: one should not lose sleep over what to feed 3 year olds. Ultimately the only thing we needed was a Piñata. Voila, it's a party. Best $8 dollars i ever spent. All in all it was an easy event, and loads of balloons made for a festive atmosphere. Our itinerary included: a slip-n-slide (or rather, a huge sheet of plastic from Home Depot), squirt guns, trampoline covered with colorful plastic balls, buffet of "bug" candies, a taco bar, piñata, and of course cake and party favors! We also had lion masks for the kids to color but ran out of time for frivolous extras. So as not to waste any effort, i'm sharing the invitation and tags. Click on the "freebie" link below if you'd like to adapt these for your own fiesta! Now that my little man is three he's developed a major new obsession... any guesses as to the likely theme of next year's party? Because i can't get enough of my mom, i of course dragged her right into the fray. We started with a fantastic youtube tutorial on making tutus (Julie's tips for creating this no-sew skirt are definite time savers! ), and then nearly a million trips to JoAnne's to get the right amount of tulle, ribbon, and flowers. tips: purchase darker fabric colors than you think you like, and more than you think you need!, and a box with small compartments works wonders for keeping trimmings organized. We finished our skirts by attaching a massive silk flower and accent leaves to give it that fresh from the forest runway look. The pirate dressups were much easier. An eyepatch, a sword, and a simple strip of black leather-like fabric made for a nice belt. With their costumes complete it was time for the treasure hunt. easily the biggest hit of the day (many thanks to T for this creatively constructed activity and beautifully written clues. dad of the year for sure!). Each clue started with a task: walk the plank, march around the tree; figure out who is the tiniest fairy; sing happy birthday..., and at the end of the hunt was a treasure chest full of party favors. Lil and Ev stayed up late the night before filling the goodie bags with bubbles, jewelry, chocolate coins, and of course pixie sticks! Each time they completed a bag and placed it in the chest i made them say "Argh Matey". oh the cuteness. For decor, i draped the room with a sheer canopy, hanging lanterns, ribbons, flowers, and butterflies (cut with my cricut!). It took me the better part of the night to perfect, but i knew i'd landed myself in the "best mom ever" category (at least for a week or so) when Lil rolled out of bed that morning and exclaimed "wow, this looks incredible! ", and couldn't stop squealing with delight. The mini tiered cake was made by my sweet friend Sue, and was as delicious as it is beautiful. She also made chocolate and vanilla cupcakes using gorgeous "petal" wrappers. all in all we pulled off a celebration the birthday girl won't soon forget. and as my sweet little one heads off to kindergarten and grows up far quicker than i would like, i hope i won't soon forget our precious time together either. LilyBean just celebrated her fifth birthday (gasp! ), and leave it to me to go overboard on the party planning... shocking right? ;) i've got over 100 images to sort through before i can do a proper post documenting the chaos, but for now here's a peek at the invitations. The fairy image is a quick sketch of LilyKate in her Tinkerbell costume, and the floral pattern is adapted from some old designs i had on hand. After printing the invitation I covered the edges in pink "fairy dust" (aka glitter. i highly recommend the Doodlebug variety!). To complete the look, i broke out my trusty Cricut machine and cut two sizes of butterflies (using the Home Accents cartridge), which i layered and tied to the invitation with ribbon. The mini fairy sized invites were then slid into small vellum envelopes. voila, the mood was set! i can hardly believe my baby is 1! we celebrated with a trip to the zoo, a ride on the train, and finished the day with a "train" birthday cake (inspired by the artwork i did for the BasicGrey paper line bearing the birthday boy's name). in the future i think we'll leave the cake making to the professionals, but we certainly had fun! we dyed coconut to use as grass, used m&m's and animal crackers as "cargo", and mini cookies and crackers for the wheels. A while back Cath invited me to join the Paper Crafts Editorial Board. I can't tell you how flattered I was (and am!) to be included in this group of incredibly talented gals, many of whom i have admired from a distance for years. They are each brilliant, and getting the chance to meet them in person was in itself amazing, but then spending two days with them dishing about the industry, trends, and favorite products and techniques was a dream. so thank you Cath for including me, I left feeling inspired. and rarely do I get to spend an entire day playing with paper, so it was nice that at the end of the week my cute niece kynzi had asked to come craft with me. She loved a project i did for Paper Crafting 3 Ways so much that she wanted to create her own variation, so she came over and the two of us got busy crafting. 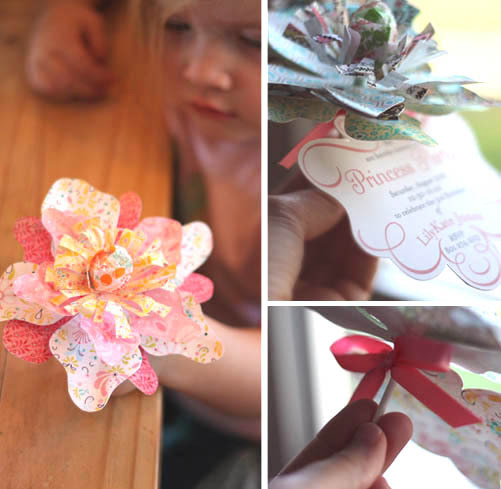 we had a blast, and it occurred to me that one of the projects, a lollipop flower i created for Lily Bean's birthday invitations, would make a fantastic freebie pattern. Mine were constructed from various BasicGrey Urban Prairie papers, but you could use any number of paper options to achieve different looks. Some rich red and green tones and these could easily mimic Poinsettias! The freebie pattern download here uses samples of paper from the Flutter digital scrapbooking kit. enjoy! for kynzi's projects pictured above we used mostly BasicGrey papers as well as some flowers and the fantastic Butterfly punches by Martha Stewart Crafts.